For 50 years, fishkeeping enthusiasts have looked to the Tetra name for products and solutions that add ease and beauty to their home. Whether you're an experienced hobbyist or just starting out, Tetra has everything you need–-from a large variety of quality fish food and innovative equipment to test kits and decor. Tetra Whisper EX70 Power Filter is the intuitive filtration system. Every feature of the Whisper EX has been designed with simplicity and convenience in mind. This is truly the intuitive filtration system. Outflow maximizes water agitation and oxygenation. Whisper EX Filtration Systems use Tetra EX Carbon Filters. This filter is ready to go right out of the box with no priming required. Continuous flushing action prevents debris buildup with scientifically engineered water flow. 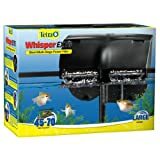 The Whisper EX70 Power Filter is great for 45-70 gallon aquariums. Use large cartridges to keep your power filter working properly. Allow Whisper Multi stage power filtration to keep your aquarium clean and clear. 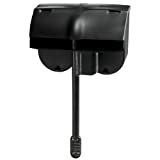 Interested in the Tetra Whisper EX Silent Multi-Stage Power Filter for Aquariums? Is the price too high? You can easily price watch this product and we'll notify you when the price reaches your target.